Take Action, Build Your Business! Traffic, traffic, traffic! Every webmaster needs always more! We all know how organic traffic is so unstable, so one of the most effective methods to build a base of users is via social media. Most bloggers with experience definitely use this tool, but for the few of you who do not know about it, in this article I write a guide about JustRetweet. JustRetweet is a fantastic platform where you can expand your social media audience, by sharing other members posts and gaining credits, while you want to submit your content and get it shared by other users. It’s easy to create an account with JustRetweet. You just need to sign in with your Twitter credentials and indicate your email. That’s all. After this, you will start with 100 credits. It’s up to you, then, earning more credits, by sharing some content searching between categories in the homepage or just submit your first post. Your first submission will be moderated. If it will be fine, your next tweets will go directly to users dashboard. Be sure to not submit affiliate links, sales pages, homepage of your websites, in order to avoid getting blocked. You might want to check JustRetweet guidelines here. – you build new connections with real and popular bloggers of your niche. So when you have new posts to share, or if you want to promote your old content, you can submit your link to this great platform. It’s very easy to set everything. In “settings” menu of your account, you may set the “tweet interval” (I have choosen 2 hours), or if you want to tweet your own submissions automatically, there is an option for it. You can set how many credits per follow you would like to give to your new followers gained thanks to this site. You might want to add your website title, URL and description. Also, when you have to submit new content, just be sure to follow the site guidelines and choose the proper category for your posts to share. If you need it, you may even block users if you do not like their content. This is one of the last new features added to this site. Another news on JustRetweet is that there is a scheduled tweet limits of one day. It is visited and used by real people, and you can even expand your connections here. A lot of popular bloggers use JustRetweet, as for instance Justin Germino, Jane Sheeba, Ileane Smith and many others. This is a real plus, as your content will be shared by these BIG names of your niche and your blog may be visited by the audience of these popular marketers. 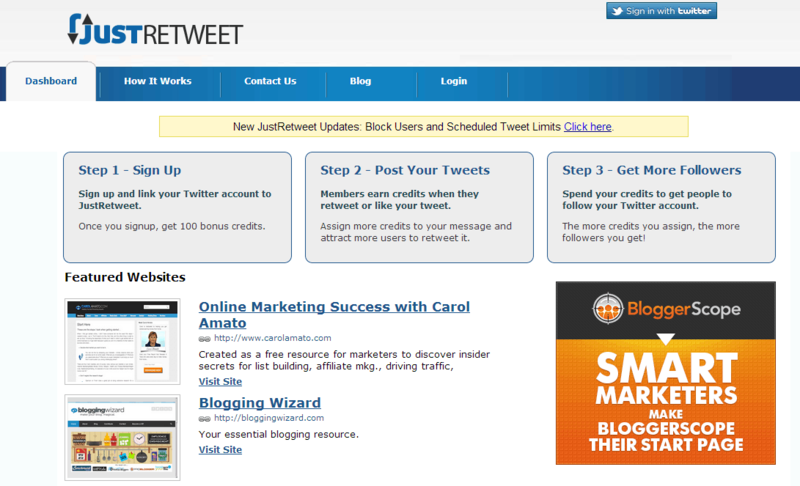 As you see, there are so many benefits of using JustRetweet, that makes it a really useful and valuable free tool. If you do not have time or you just want to be featured on the site homepage, you can purchase a package choosing between the premium services. You may want to be featured for 3 days as VIP and gaining 5000 credits for just 30$ or you may choose to simply buy 2000 credits for only 10$. 1 Month VIP + Website Featured + 20,000 credits for just $99. Whether you want to expand your audience or share your last post, be sure to visit JustRetweet. It’s very easy to understand and you just need few minutes to gain huge benefits from using it. What about you? Are you already a member of JustRetweet? Please share your point of view in the comments below, thanks! Hi! I am Erik Emanuelli : problogger, marketer and social media addict. You can follow me on Twitter, add me on Facebook or follow me on Pinterest. I’ve been using JustRettwet for a while, and the truth is that I have achieved some good results. It is a good way to get some followers on twitter and get some traffic, too. 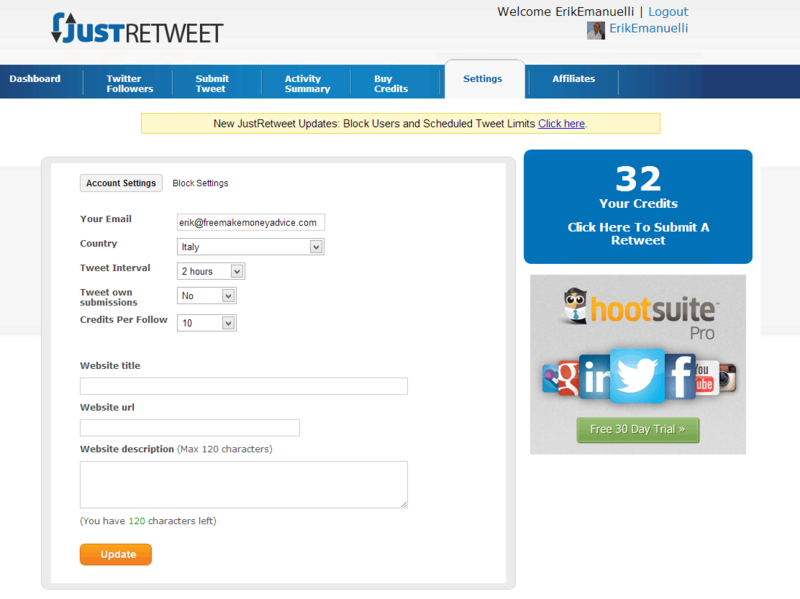 JustRetweet is an effective tool to get more traffic and more followers from Twitter. Thanks for your feedback here. Hi Erik – nice write up here on JustRetweet. I have been using it for a little while now and have had moderate results. I also use EastRetweet, which follows a similar pattern to JustRetweet. Have a great day! I am glad you liked the review of JustRetweet. I have been using also EasyRetweet in the past. When you are looking for keep your business to a strong position in online, must take various type of actions. Which will be effective for our business and can drive more traffic on our site. Driving traffic by twitter is also a valuable process. Because there are a lot of peoples are using twitter in this day. So knowing about this really helpful for us. social media is one of the sources alternative to organic traffic. And more stable, I must say. Thanks for your visit here. Your post is looking beneficial for me. I didn’t know about JustRetweet and its benefits. Thanks for Review. Everybody wants some extra traffic and followers. Without Traffic any website and blog is nothing. Traffic is backbone of every blog. I am so glad to have you helped. You should try JustRetweet, you’ll see the benefits right away! I have been using it from the past 3 month and getting little traffic with it. Sometimes, It helped me to get the blog post ideas for me. Thank you for your feedback, Nirmala. I had joined and used this tool to get some of my posts Re-Tweeted but it didn’t help me get traffic but t managed to get me some new followers . Thanks for sharing the information mate . keep using it, you will see traffic increase! Nice review, Justretweet is really great when it comes to boosting blog traffic, I really feel happy using it always because of it flexibility. Kudos to Valentine Belonwu the first C.E.O of justretweet and I am really happy that some great like just retweet is from Belonwu. glad you enjoy using JustRetweet. I find it useful too. Valentine had a great idea when founding it. This is the awesome review about JustRetweet .now i think this is going to help me in getting more trafic on my site. Now you can get more traffic with JustRetweet. Great post Eric! I wasn’t aware of this service, but I’m definitely going to make an account now. It seems a littler EmpireAvenue with the credits and all. This is my first time visiting your blog, and I really enjoyed it! I’ll certainly be back often for valuable information. Have a great day! thanks for your kind words and I am happy to see you enjoyed the content of my blog! Thanks for your comment and please, come back again! I have never heard of JustRetweet, it seems like a great way to get traffic to your site. This definitely looks like something that I need to implement. After all we can always use more traffic to our site. Thanks for the information. You’ll see the benefits of traffic and social media exposure. I have been using JustRetweet for more than a year now and it has been really a great help in spreading my message to the world and bringing traffic to my blog, Thanks for this detailed review. Thanks so much for your feedback. I always appreciate your visit here. Firstly thanks a lot for your post! i’ve using JustRetweet for 2 months and it;s help me so much about attract more,traffic to my blog. Your post is really help me about the detail. Keep looking for your new review. I am glad you have found the post useful! Thanks for nice sharing. I learned now about Retweet. Its informative. fabulous article i must say. Its a fantastic tool that everybody should use to increase the traffic on website. it will definitely help new bloggers to increase their website level in SEO. Glad you liked the article, Nitin. Thanks for sharing, just signed up! Started using justretweet recently. Justretweet a great idea indeed. I have a doubt. Can you please tell me how to become a featured member without paying for it. Is there anything like that? Please let me know! I think there is not other way to be a featured member without paying. The free account has still so many advantages. Are those retweets gained organically? Or by spambot? Because if it’s the latter, then no thanks. They are ReTweets made by real users, David. Yet another superb post. Thank you so much for sharing this freebie tool with us. I have just signed- up and working with it to get something possitive. I found out justretweet from one post of Enstine sir. He also shared an alternate named easyretweet. Which is the best one sir? I noticed that big b names on the homepage itself. I got 2 new followers and many of my tweets favourited. So I want to continue with it. Thank you so much sir. Looking forward for another jaw- dropping post. JustRetweet is a great marketing tool linked to the major social media. You can get nice traffic and social shares from posting your content there. I’ve been using it since a long time already. I prefer it to EasyRetweet. What’s the current status of JustRetweet? I made an account here for over a year ago yet my tweets have not gone live. I tried contacting Chris Fong via email, twitter and facebook but no response. If not then how do i get mt tweets live, and actually use all the features now? I’m using JustRetweet every time I need to market an important post. The site is live and has no problem to me. You need to have your account activated, to start using it and have your first campaign live. That’s all I can suggest you! How to Get Likes on Facebook – 500 and More FB Likes in 2 days! Social Network Sites – Which One is The Best for Traffic? How to Make Your Blog Popular?